‘Freelance Wastrel’ has proved surprisingly easy to create posts for and writing it has put me in touch with some fantastic people, I’m hoping that I can maintain the momentum of creating content for it throughout the winter months. Series E 50mm f/1.8, introduced in 1978 along with the budget Nikon EM SLR. This is the first version of the lens that doesn’t feature the traditional chrome mounting ring. (Bottom right). 50mm f/2 Pre-AI, one of the oldest lenses in my collection, manufactured between 1963 and 1967. The ‘H’ appearing after the ‘Nikkor’ name indicates the number of elements making up the lens, in this case 6 (Hex). (Centre). 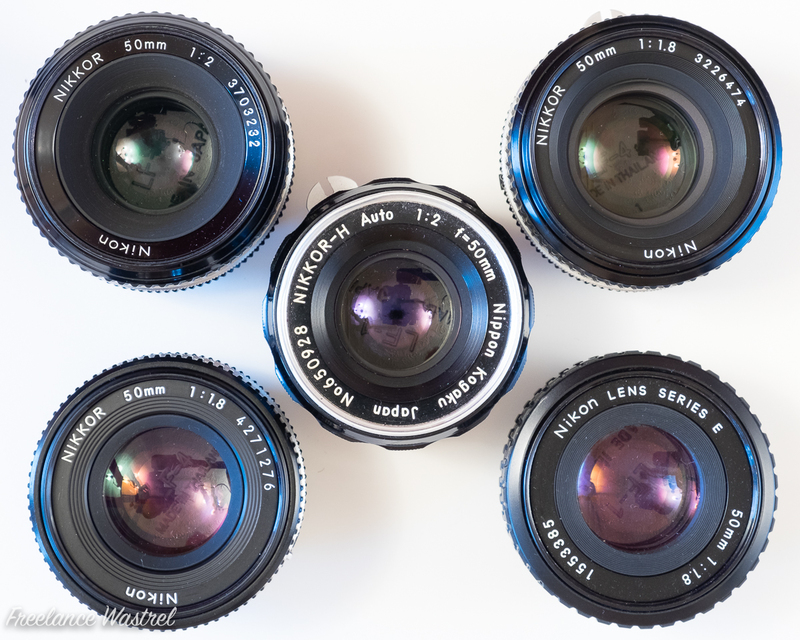 I do still use every one of these beautiful lenses, some more than others but they all get an outing from time to time, earlier this year I mounted the Pre-AI lens on my Fujifilm X-T10 (via an adapter) and used it to photograph a friend’s band in a local pub.